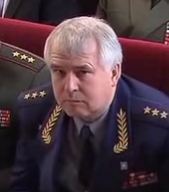 In his recent NVO interview, VVS CINC, General-Colonel Aleksandr Zelin wasn’t as specific about transport aircraft and helicopter acquisition as about fighters. He mentioned “reestablishing” An-124-100 and An-124-300 production, and said the Il-76MD-90A will fly in July. The An-70 is moving forward with Ukraine, he says. The VVS has settled on the An-140-100 as a light transport. Russia will work jointly with India on a light MTA (multirole transport aircraft? ), and Moscow may buy up to 100, according to Zelin. Zelin concludes VTA must have not less than 300 aircraft. That might actually be about what it already has. The CINC says the General Staff wants VTA to be capable of lifting a “light” brigade anywhere in the country or abroad if necessary. On helicopters, General-Colonel Zelin reemphasized the goal of 1,000 new ones by 2020. He mentions getting about 100 Mi-26, or Mi-26T, heavy lift helos, as well as the Mi-8AMTSh, Mi-8MTV5, and Mi-38 (another Mi-8 variant). Zelin says little about the Mi-28N and Ka-52 except they’re complementary. He sees no need to choose between them, but the former will be the military’s line combat helicopter.